I am both excited and a little confused. The video doesn’t reveal much–and I’m glad there’s still an element of mystery–but it DOES give me something to look forward to. Nearly every summer growing up I could not wait until July for the next book release (they were pretty regularly released the week of my birthday, which always felt like a personal gift thank you very much J.K. Rowling). And then we looked forward to the release of each new movie. 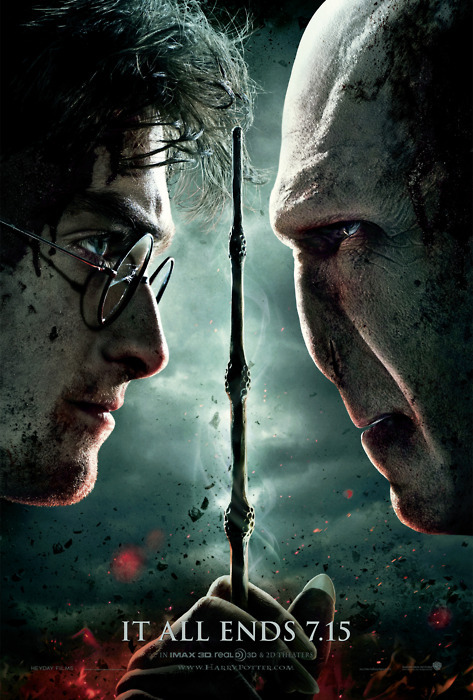 And recently, we could all feel the dreaded end looming over our heads.I think J.K. Rowling realized how pretty much the world culture was getting super depressed by the “It All Ends” posters. A week ago, we all thought we had nothing to look forward to anymore. So I appreciate that the suspense is being extended a few more months. Just like all the previous releases, we don’t know much about the content of the next “reading experience” as she phrased it. Just some clues and hints. Enough to whet our appetite. Not to brag, but I think I pretty much called it (in the comments). She’s constructing more material within the confines of the already written Harry Potter world and releasing some old resource material she’s been holding on to. What do you all think? Disappointed? Excited? This has inspired me to go out and purchase audiobook versions of the books. I can’t wait…to relive my childhood half an hour every night before bed. Long Live The Rowling. I cannot wait for Pottermore! Also…this has me thinking. I realize that the Potter books are really works of popular literature, but that doesn’t mean…that they cannot be analyzed. As a former English major, I would love nothing more than to read and analyze the books that shaped my childhood. Glad you feel inspired to go relive your childhood! I wish I had time to reread the Harry Potter books all the time. I read them all aloud to my kid sister a few years ago and we had so much fun with it. I know that some colleges have classes where you can do literary criticism of Harry Potter. (Not mine, of course. We did not have cool classes like that). You should totally do a paper on it; I’d read it. What angle do you prefer? Psychoanalytic? Evolutionary?